This past year I started reading Robert Marzano’s The Art and Science of Teaching to guide my instruction. So many aspects of that book spoke to me. I love the idea of having students use a four (or five) level rubric to assess themselves before, during, and after their learning of a specific standard. 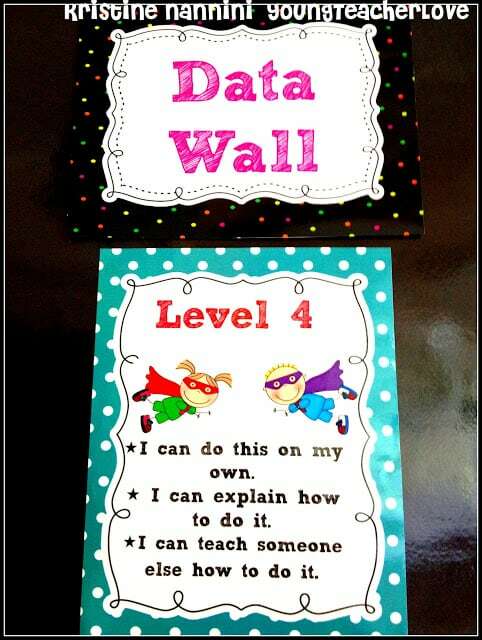 You can read more about how I incorporated Student Data Tracking Binders into my classroom HERE. In many of my posts, and in my creating of Common Core I Can/We Can statements, I emphasize the importance of learning targets. These learning targets are so important for all of your students because they convey to your students a destination for their learning- what to learn, how deeply to learn it, and exactly how to demonstrate their new learning. Without these specific learning targets and a precise description of where they are headed, many of our students are left flying blind. “Regardless of how important the content, how engaging the activity, how formative the assessment, or how differentiated the instruction, unless all students see, recognize, and understand the learning target from the very beginning of the lesson, one factor will remain constant: The teacher will always be the only one providing the direction, focusing on getting students to meet the instructional objectives.” (Zimmerman 2001). With your instruction, you first communicate your learning goals to your students, plan a guided learning activity that takes place in the classroom, and then plan for assignments that are engaged learning experiences to extend classroom learning. In between these learning goals, learning activities, and assignments, you plan time for formative assessments. 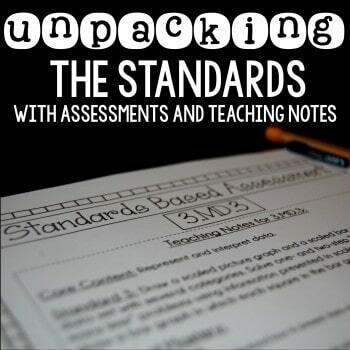 Formative assessments are so important throughout the learning of a unit or standard. They provide students with feedback during instruction or as the student learns, versus providing students with feedback after learning with a test at the end of a standard or a unit. 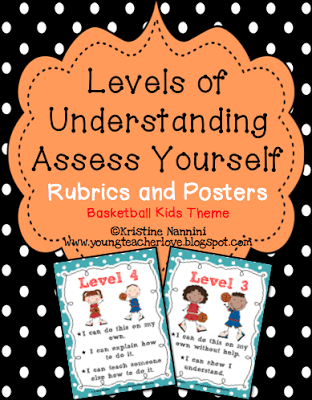 With these formative assessments comes Marzano’s scales and my Levels of Understanding Posters and Rubrics. By using a scale, the teacher and the students have a clear direction about instructional targets as well as descriptions of levels of understanding and performance for those targets. When using my Student Data Tracking Binders or my Levels of Understanding Posters and Rubrics alone, students self assess their level of understanding for specific learning targets. 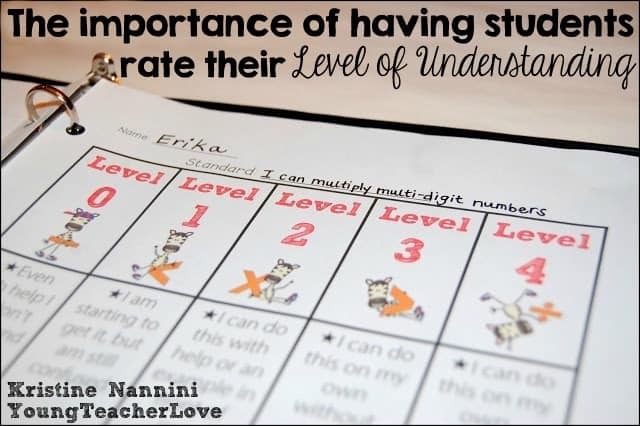 When students self assess or rate their level of understanding, there are benefits for both the teacher and the students. It promotes intrinsic motivation and more meaningful learning. It also empowers students to guide their own learning. Students who are taught self-evaluation skills are more likely to persist on difficult tasks, be more confident about their ability, and take greater responsibility for their work. For my specific rubrics or scales, I used kid friendly language and kept them very simple. 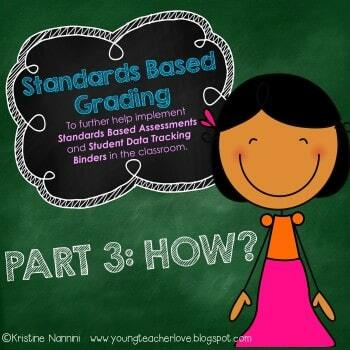 To see how I have my students rate their level of understanding using my Student Data Tracking Binders, click HERE. 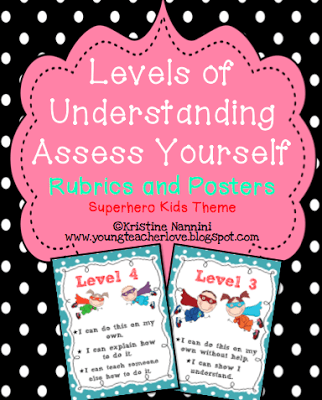 Below are the Levels of Understanding Rubrics and Posters found in my store. 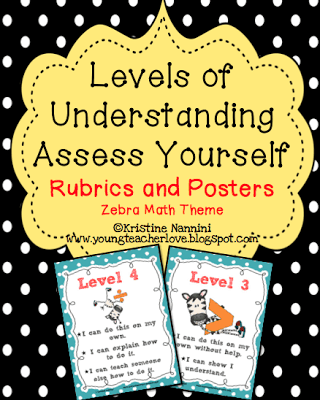 Click each link below to read more about each poster and rubric pack. I love this! It is so important for students to self assess, and I’m afraid it is something that we often feel like we don’t have time for. I am your newest follower! Thanks so much Linda. I know- this can be tough. Do you think you will be implementing something like this in your classroom? Make sure you follow my store as well, because I just added a whole packet of Student Data Binder sheets that I will be blogging about tomorrow. Thanks so much for following! please do I can statements in a rock and roll theme. LOVE this idea! Trying to incorporate it into our Canadian Outcome based curriculum for grade 7 probability! What do you do with those students who are absent during a pre assessment? or those days when you are teaching the standard(s)? How do they keep up? make up lost time/material? Are assessments given to everyone at the same time or individually when they feel they are ready for it? Also, if a student passed the pre assessment with 80% or higher, what would you have them do? Do they move on ahead of the class or are they given enrichment work? I may have missed this part but when they rate it and date it, what exactly are they rating – the standarsd based on the results of their pre assessment? I just randomly came across your blog and you have so many amazing ideas. I was just moved to 5th for the upcoming school year and I can’t wait to check out all your resources! 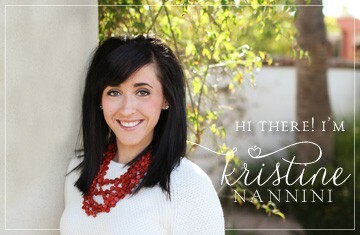 I am also your newest follower on Bloglovin. Thanks so much for sharing all of your hard work! You are gifted and I truly appreciate you being so willing to share what works for you! I wondered if you could tell me how you use these on a daily basis. For instance, when you introduce a new standard/concept do you present/post your posters of the “I Can” statements and the standard posters? They are all so cute, I cant imagine them not being displayed somewhere. Before purchasing all of these different documents, I want to make sure I understand how best to use them daily. Can you help me picture that? And at the end of my purchase, which documents should I have? (ie – student binder, assessments, “I Can” posters, etc????) Thank you, thank you!! I have really been using your posters this year for students to self-monitor their own performance. They are doing such a better job of being self-aware of their own learning. Thank you! 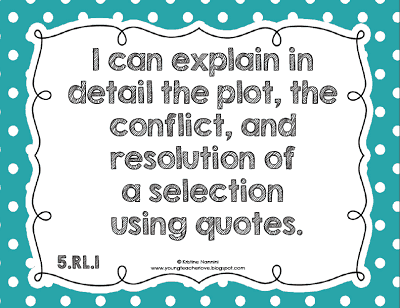 I love your rubrics! I have used them in my classroom and my kids love them too! 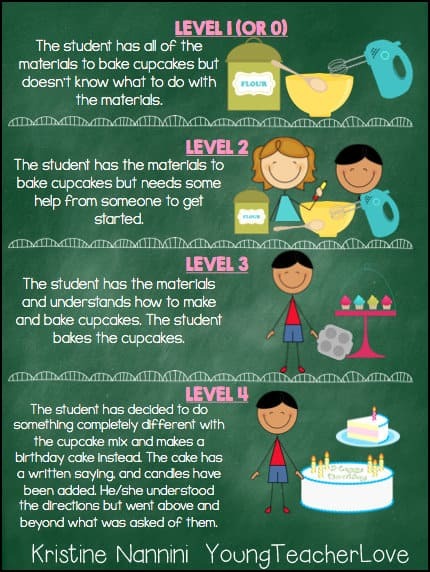 I can not seem to access the cupcake/baking analogy poster for levels of understanding. Help! It’s too darling and absolutely perfect! @Mrs. Wright- You can grab the cupcake analogy poster at the bottom of this post: http://youngteacherlove.blogspot.com/2013/09/walking-through-standards-based-grading.html. Just scroll to the bottom of the post where it says, “For those of you that have been on this standards based grading ride from the beginning, as promised, click here to grab all of the info!” I hope that helps! As a perfectionist, I was incredibly hard on myself through my first year of teaching. 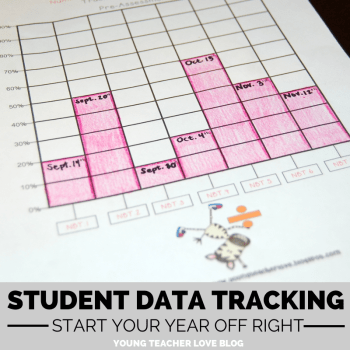 I felt like I would never figure out a system that knocks out so many of the struggles that I had- having students track their own data, neatly categorizing and organizing assignments by standard, and, most importantly, forming small groups that are as beneficial to my kids as they can possibly be. Preparing for my second year, I’ve been hunting all summer for highly organized and easy-to-implement programs that I could put together and will work for me. Needless to say, when I saw your Student Data Binders, Teacher Data Tracking pages, and your Standards Based Assessments, I almost cried. I am so thankful that I came across your blog post about implementing the data binders- the pit in my stomach is gone. I’ve found a comprehensive and organized system that helps solve ALL of those struggles in one, concise package. I cannot WAIT to use your system this year- thank you, thank you, THANK YOU for all of the work that you have put into this. Please know that you are bringing so much calm to this teacher’s heart!